A Long Term Disability policy of insurance (LTD Policy), is a policy designed to cover the insured for a monthly benefit in the event that person becomes disabled. These policies are often offered by employers, to employees as a part of their benefits package. It’s a common perk of employment. Like saying that you work at Google, and they offer a generous benefits package. That package includes LTD Benefits. The nice thing about this is that the employee has a benefits package. The bad thing about it is that the employee doesn’t have much say about what goes in to that benefits package, how much those benefits are worth, and the benefits will likely cease when the employee ends his/her employment relationship with the employer. No longer an employee of Google? Then no more LTD benefits are available to you. Other times, LTD Benefits are purchased privately through an insurance broker. In this instance, the policy holder (that’s you) gets to pick the right amount of coverage which best suits their lifestyle and financial situation. The LTD benefits are NOT tied down to a specific employer. They follow the insured person from job to job. These benefits are great for contractors, self-employed persons, people who don’t have benefits offered through their employer, or even people who have benefits offered through their employer, but just want additional coverage because the coverage offered through their employer isn’t necessarily the best. Some of the large companies who offer LTD benefits (both group and individual policies) are Great West Life, Canada Life, Sun Life, Standard Life, Manulife, RBC Insurance, Industrial Alliance, Co-Operators Insurance, Desjardins, SSQ and Equitable Life just to name a few. As you can see, there are quite a few LTD Insurers out there to chose from. It’s important to note that each policy is different. What’s most important to the insured, is how the policy works to get you paid in the event of disability. The term “disability” is a VERY broad term. Don’t believe me? Here are a few insurance examples from car insurance policies, and LTD policies which define what it means to be “disabled” to receive benefits under their policies. 7. an impairment or combination of impairments that, in accordance with the American Medical Association’s Guides to the Evaluation of Permanent Impairment, 4th edition, 1993, results in 55 per cent or more impairment of the whole person; or 8. an impairment that, in accordance with the American Medical Association’s Guides to the Evaluation of Permanent Impairment, 4th edition, 1993, results in a class 4 impairment (marked impairment) or class 5 impairment (extreme impairment) due to mental or behavioural disorder. That’s a pretty extreme, onerous and medically challenging definition of disability to meet. But that’s what Standard Car Insurance policies of insurance require; so all Ontario drivers have to adhere to this definition for the purposes of meeting the CAT Test of disability. After 24 months of payments, you are disabled when the Insurer determines that due to the same sickness or injury, you are unable to perform the duties of any gainful occupation for which you are reasonably fitted by education, training or experience. At the time the claim is adjudicated, and while it continues during the Elimination Period and the following 24 months, prevents the Employee from performing each and every duty of her regular occupation or Employment. Disability and Disabled: During the participant’s elimination period and the first 24 months following the elimination period, the participant is not able to perform substantially all of the essential duties of his own occupation and earn at least 80% indexed pre-disability gross monthly salary due to an illness or injury, as determined by the insurer. Thereafter, the participant is not able to perform substantially all of the essential duties of his own or any occupation for which he is reasonably qualified by training, education or experience and earn at least 70% of his indexed pre-disability gross monthly salary due to the illness or injury, as determined by the insurer. The purposed of this Toronto Injury Lawyer Blog Post is to illustrate to you that there are many different definitions of “disability” under LTD policies. Some of those definitions are more simple than others. Some relate solely to injury, others relate to your ability to earn money at your own job, or at a different job. It’s also important to note that these are LEGAL terms which are heavily scrutinized by lawyers. Law is about splitting hairs; and if an insurer sees a way to get out of paying your claim on account of that legal definition of “disability” contained in your policy; they will use it. That’s how these policies work. What we have NOT covered in this Blog Post are the exclusions under these same LTD policies, which are just as important as the definition of disability. This can be the topic of a future Blog Post. But, if the exclusions contained in the LTD policy prevent payment on account of a back injury, fibromyalgia or psychological injury, or preclude payment for over 3 years, then that’s something which the insured needs to be aware of. Those exclusions, coupled with the definition of disability will be the difference between getting approved or getting denied LTD benefits. 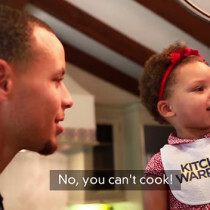 Yes: that IS a picture of Riley Curry and Steph Curry. Yes: I’m looking forward to the LeBron James vs. Steph Curry matchup in the NBA Finals.